Manufactured in Japon from Circa 1958 until 0. This camera is very complete and would not have to make red of the comparison with a Rolleicord Va, if it is not on the side of the lenses. Yashikor’s do not equalize Xenar’s. 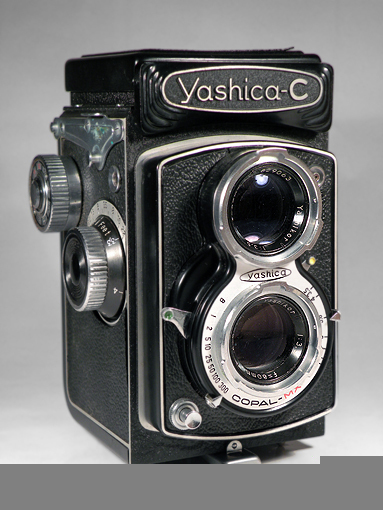 On the Yashica, the two lenses are identical and have each one a bayonet to fix a lenshood or a filter. The aperture and speed adjustments are done by a cursor located of each side of the taking lens. On the successor of the C, the D, the cursors will be replaced by serrated rollers. Under the cap a magnifying glass is to refine the focusing, which is done while turning the big lateral knob.